Facebook is a great way to stay in touch with the people around you, but there is also the fact that a lot of the people that you share this online space with are not etiquette savvy. In fact, they might want to comment something hurtful on the posts that you share, and there really is nothing you can do apart from deleting comments after they have been posted. While this is useful it doesn’t change the fact that you have probably already read the comment so it’s already had the intended consequence. Facebook is testing a new feature that would make situations like this things of the past. While there is already a spam filter, it doesn’t work nearly as well as it should. This is probably why Facebook is going to let you moderate your comments a lot more efficiently. You will be able to make a list of words or emojis that you don’t want appearing on your comments threads. Anyone that tries to leave a comment on your timeline with any of the words/phrases you have banned will find that the comment simply isn’t posting. However, users who post those comments and their friends will be able to see them. 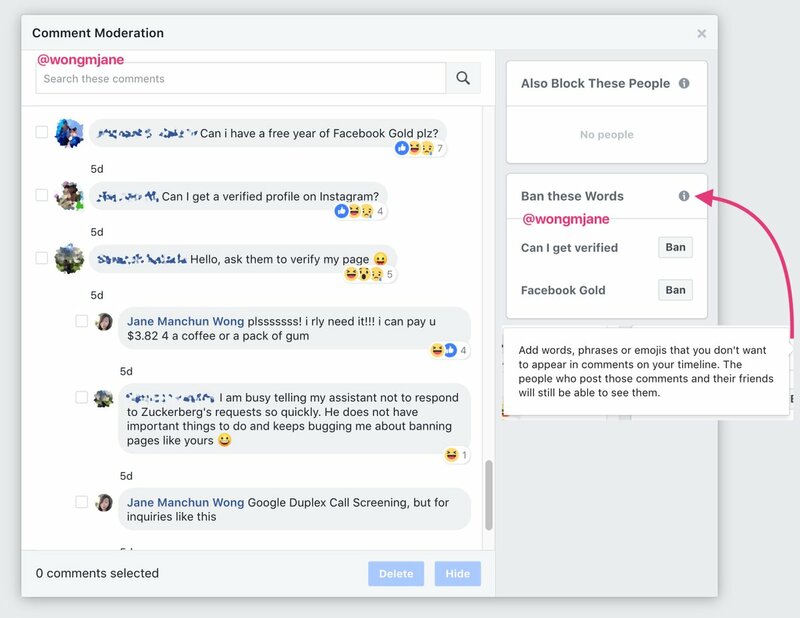 "Facebook is working on letting users to ban words/phrases/emojis from showing up on their personal timelines", noted Jane Manchun Wong a social media app researcher. This is indeed a useful feature because it can help you control the conversation that occurs on your Facebook profile. If you are the target of undue aggression in the form of hate speech or if, for example, you have just broken up with someone and you just don’t want their name mentioned for a while, you can make sure that no one is able to comment anything that might upset you. This could go a long way towards bringing a lot of people that left Facebook because of the hostile nature of some of its users back to the social media platform.